Hi, i just wanted to ask if its possible to activate a Wireframe Mode? I have nothing found with the search function an i have tried to write Wireframe in the Console in SE but nothing happens. Oh sorry. I had never thought it's in "News and Announcements". It is possible to toggle wireframe mode in Debug mode (modes are switched by "*") with Shift+K combination. And you can play with this mode too, only you have to use Debug mode to switch it off again. Oh wow, thanks for correcting me. Thanks a lot! That's really interesting with wireframe mode. But i think that are way to much polygons on planets, aren't they? Well i think you can display the same detail with much less polygones like in the picture. But maybe there are some reasons with the coding that i don't know. It was just my first thought when i saw the planets in wireframe. How do I go into debug mode, by pressing "*" which I assume is shift-8 (SE doesn't follow the actual keyboard layout)? That doesn't work for me. The days when we must count each single polygon are far away in the past. Modern GPUs can easy render 100k+ polygons... with the same speed as 2k polygons. At detail level 2 I get around half a million polygons or so according to the debug mode. It runs completely smooth, but if I enable wireframe mode, the framerate drops quite a bit. Which is interesting. Modern GPUs can render only triangles. This mean that lines are rendered as two narrow triangles (btw, ATI drivers on my laptop have a bug - they render only one triangle of two). So each triangle of a planet surface now rendered as 6 narrow triangles. Also, in wireframe mode, model become transparent, so far parts, that usually rejected by z-test, now visible. Modern GPUs can easy render 100k+ polygons... with the same speed as 2k polygons. But why is my framerate always dropping down on planets? 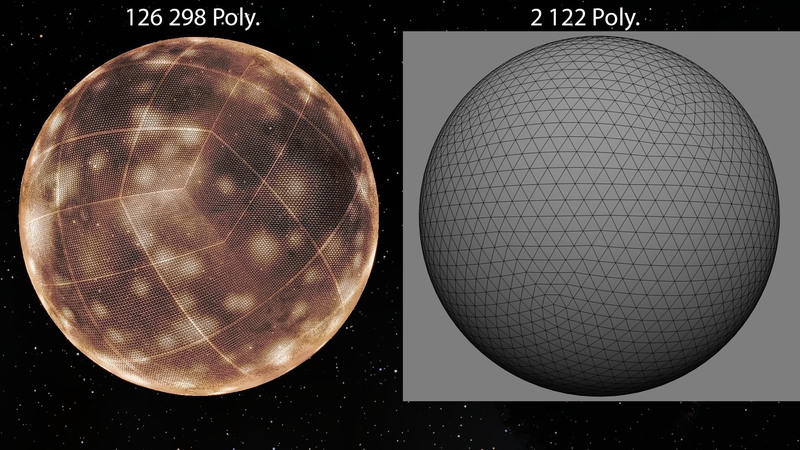 100K is maybe not much but some gas giants have 3,6 million Polygons. If the reason is not the polygon count what is it than? It is not that i don't believe you i just want to understand it.